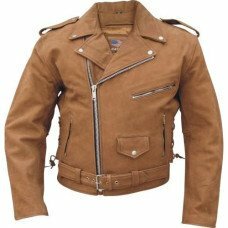 CKBProducts.com has a huge selection of wholesale leather motorcycle jackets at discount prices. There is no reason why you should pay retail prices when you can get a quality black leather jacket that comes in both men's and women's styles as well as kids leather jackets. At CKB Products we have gained our reputation by offering discount quality leather motorcycle jackets to the public at wholesale prices so check out our wide selection and start saving. As low as: $102.70 each.